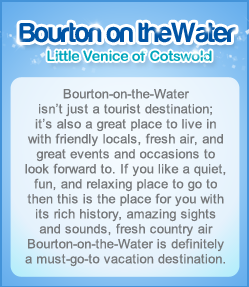 Bourton-on-the-Water is a great place to visit but like any vacation you take you also have to think about where you’re going to stay. Luckily Bourton-on-the-Water has plenty to offer when it comes to accommodations such as historical hotels, cottages, bed and breakfast, and many more. You can find Lord of the Manor near Bourton-on-the-Water in a village called Upper Slaughter. It is arguably one of the best luxury hotels you can find there. And of course it offers tourists delicious food and wine, and not to mention a view of the 8 acre private garden where you can go to while staying on the hotel. If you’re looking for a more “homey” kind of feeling when staying in Bourton-on-the-Water, you can try staying in the numerous bed and breakfast accommodations in Bourton-on-the-Water. They offer fresh home cooked meals while staying in a historic building making you feel right at home. Bourton-on-the-Water also has cottages that even date back to the 14th century. These cottages use Cotswold bricks yet still offer amenities such as television, internet connection, centralized heating, and are fully furnished. You can also try staying at Inns where you can relax and have a drink at their bars with open log fires and restaurants that serve delicious food. If you’re more of an outdoorsman Bourton-on-the-Water has the Far Peak Camping site you can go to. This camping site is cheap and offers an amazing experience especially if you’re into stargazing and cooking up barbeques. Another great thing about camping in Far Peak Camping site is that it is a large area so your kids can enjoy playing and doing other fun activities. There is also a nearby pub where you can go to if you want to eat and drink a little. Accommodation is just as important as the destination and when going on a vacation to Bourton-on-the-Water there’s no doubt that you’ll definitely have a great time with the attractions and events. And when it comes to accommodations in Bourton-on-the-Water, you can definitely just sit back and relax while having an amazing view of the country side and breathing fresh air.